If you live in a sunny climate or at least experience a few beautiful days, you are sure to own a sun hat. After all, a sun hat is a necessary item not only to tie your outfit together, but to protect your face, head, and neck from the intense rays. 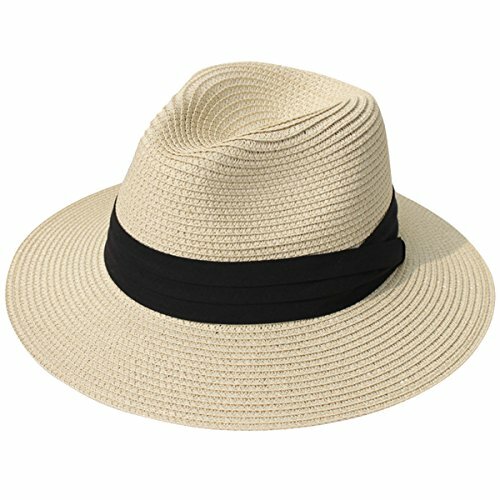 While you might fall back on a favorite sun hat that gets a lot of use, have you ever considered there might be a range of other options out there to cater to your every requirement? Having more than one sun hat can be more beneficial than you think. Firstly, you get to choose from a variety of options on the market such as floppy, straw, foldable, or cotton. You may just find there’s a style to suit each outfit you wear to the beach. What’s more, when you buy a second sun hat, you’re protecting your head, face, and neck if you should ever find yourself losing one. You can keep one in the car at all times, ensuring that no matter where you travel, you’re less at risk of sunburn. Consider any of these nine options below if you’re considering buying a new sun hat to add to your collection. This floppy sun hat from Funky Junque is sure to appeal to a range of women looking to stand out from the crowd on a hot summer’s day at the beach. Not only is it affordable, meaning almost anyone can afford to get one, but it features unique embroidery around the rim which says “Beach Hair Don’t Care” to get the heads turning. 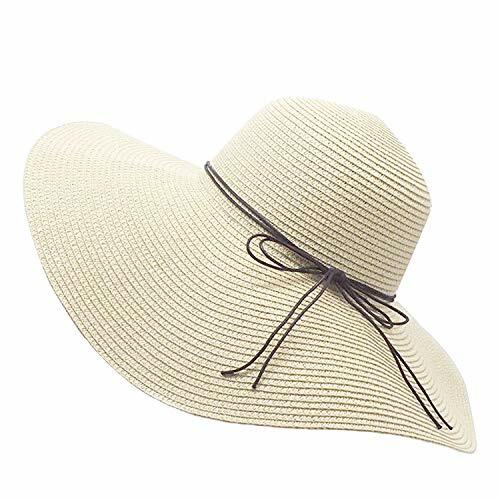 This sun hat is also suitable for a range of people, from young teens through to older ladies, and it’s a stylish and practical wide brim sun hat that will tick all the boxes for both sun protection and style. It fits most people’s heads with a circumference of 23 inches, has a drawstring to alter it ever so slightly, and is suitable for all occasions. Whether you wear it to the beach, a concert, or just shopping in town, you’ll tie your outfit together beautifully with this hat. Not only is this hat a beautiful fashion statement, but it’s also unique. Made out of 100 percent paper, it’s lightweight, durable, and is also very hardy. There’s everything to love about this sun hat so consider adding it to your watchlist today. Available in a range of colors to suit various outfits, this sun hat from Siggi could tick all the boxes for the look you’re trying to achieve. It’s made of paper straw, is foldable to make it easy to store in luggage on vacation, and it’s a stylish accompaniment to any outfit. Whether you’re dressing up for a special lunch or dressing down for the beach, you’re sure to find this sun hat looks the part. However, there is more to this sun hat than meets the eye. To ensure it fits the most amount of heads possible, it features a detachable chin strap. Not only does this help the wearer adjust it for a far better fit, but it also stops it from blowing away in the wind. How often have you had to hold your hat down as you made your way into town or to the beach? With this discrete chin strap, this is now never a problem. When you wear a sun hat, you also often do so to keep the sun off your head, face, and neck. While this hat is the perfect accessory for the job, it also keeps your head cool in the process. Instead of making your head sweat as it battles to deflect the heat, you can rest assured that it allows a gentle breeze, all the while preventing those UV rays from getting anywhere near your head. Designed to suit a range of head sizes and affordable on the market, there’s every reason to add this hat to your shopping list today. While straw hats are the more common style of sun hat on the market, that doesn’t mean everyone will like them. If you’re looking for a hat that bucks the trend while looking stylish for all occasions at the same time, this one is it. It’s made of cotton with a polyester and cotton mix lining, is suitable for a range of head sizes, and even comes in a variety of colors so you can match it to your outfit. 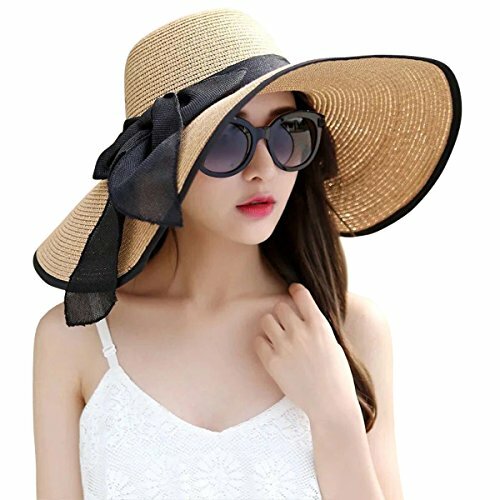 It’s a gorgeous hat, features a side bow for added elegance, and ensures that your face, neck, and head are all sheltered from the sun. Passing a UPF 50 test, it’s also designed to block most UV rays as well. What you’re sure to love too is its versatility. It’s adjustable with a drawstring to suit most people’s heads, is secure and well-fitting with a chin strap to stop it from blowing away in the wind, and even has a built-in sweatband. All boxes are ticked when it comes to your convenience. You are also sure to be impressed by its price tag along with how suitable it is for all occasions. Whether you’re heading into town, the beach, or even out camping, this hat will look the part with any outfit you put on. If you want to stand out from the crowd and make a fashion statement as you head into town or to the beach, this sun hat from Lanzom can help. Designed to not only protect your head, face, and neck from the sun but to add class to any outfit, it’s in a league of its own. It folds and packs away easily to make traveling light a breeze, is made of high-quality straw that’s perfect for sensitive skin and is also exceptionally comfortable. Whether you’re heading out on the town or just to the beach, you can look both adorable and comfortable. This hat has also been designed in such a way as to be extra adequate for protection against the sun. It’s breathable, soft on your skin, has a UPF 50+ protection against UV rays, and keeps the sun off all parts of your head. While it’s, of course, a fashion statement, it’s also a useful sun damage prevention tool. Most sun hats on the market are made of straw and don’t offer the fashion statement you’re after. This sun hat from Kylin Express, on the other hand, is designed to make your outfit pop. It’s available in yellow, lavender, peach, and blue, is sized to suit most head shapes and sizes and is made of cotton and polyester. As a result of these materials, this sun hat is lightweight, breathable, and won’t feel uncomfortable as you sun yourself at the beach. What’s more, it’s well and truly made for sun protection. Aside from its sizeable 13cm brim of which is at the front of the hat, it also has a beautiful patterned scarf that comes with it. You can tie this scarf around the hat to break up the colors, use it to cover your face to protect it from wind or have it sitting at the back or sides to protect your neck and face from the sun. This is undoubtedly one of the most versatile sun hats on the market. It’s also very affordable for the average buyer. Given its low price tag, there’s no reason why you can’t buy one or more colors to match various outfits and events. Wear them to the beach, an event, or even just out with friends for lunch. You are sure to get heads turning when you wear this sun hat from Kylin Express. Traditional Victorian attire is making a comeback, so if you want to jump aboard the latest trends, purchasing this Farseer sun hat is a must. While it features delicate detailing reminiscent of days gone by, it still fits into today’s fashion scene perfectly. What’s more, it’s functional while being beautiful at the same time. 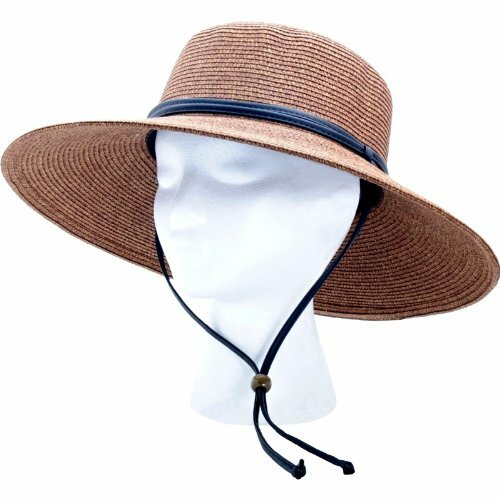 Designed as a wide brim visor, it features delicate lace on the front while being a light color to detract both heat and sunlight. The visor, while broad, is lightweight, which ensures you’re comfortable at all times. It’s suitable for use at the beach, during walks, or even games of tennis or volleyball. It will fit snugly and securely on your head while protecting it from the sun at the same time. There’s also more to this sun hat than meets the eye. It’s designed to suit most head shapes and sizes, has adjustable tape to ensure a snug fit every time and even has a sweatband included on the inside. As a result, when you’re in the heat of the sun playing a game of tennis, this hat will stop sweat from making its way down your face. While this hat cannot be machine or brush washed, it’s still a functional, versatile and stunning example of what a sun hat can be. Therefore, there’s every reason to give it a try today. If straw sun hats aren’t your style, then it might be time to consider a vibrant and comfortable sun hat from Muryobao. This functional and versatile hat is the epitome of quality and is designed to be useful for many different outdoor occasions. It’s a snug fit for most head sizes, has a chin drawstring to keep it firmly on your head in high winds, and is available in a range of colors too. Therefore, you can choose from vibrant colors such as pink and gray, or subtle tones of purple as well. This hat is a very functional accessory for everyday life, including fishing trips, visits to the beach, or even sports events. It has a full brim at over three inches wide to protect your face from the sun, has a hole at the back for women’s ponytails, and is a real space saver as it folds up for easy storage. This hat more than ticks all the boxes for the average hat wearer. The benefits don’t end there, for this hat is made with your need for convenience in mind. It’s not only made from lightweight materials to reduce its burden on your head, but it also has a mesh layer as well. This means that it incorporates a significant amount of airflow to keep your head cool and well ventilated at all times. It protects you from the sun and UV rays, is quick to dry if it gets wet and is affordable for all. This sun hat is suitable for everyone who wishes to benefit from both a stylish and functional sun hat. As one of the most affordable sun hats on the market, you are sure to appreciate the comfort, functionality, and overall style that this hat has to offer. While it might be one of the cheapest, you most certainly get a lot of bang for your buck. It’s made of cotton, is breathable and comfortable, and is suitable for most head shapes and sizes. While it’s available as one size fits all, it has a drawstring included that enables you to tighten it for a snug fit. As a result, it’s easy to keep on your head when it’s windy at the beach or on an outdoor adventure. What’s also beneficial about this sunhat is its protection from the sun. Thanks to its wide brim and UPF 50+ rating, it can shield your face from both the intensity of the sun and its UV rays. It’s suitable for traveling, gardening, trips to the beach or even camping. The best part is, it’s a beautiful sun hat that doubles up as a fashion statement as well. It folds down to a compact size for storage and is available in beige, black, and khaki to suit your tastes. 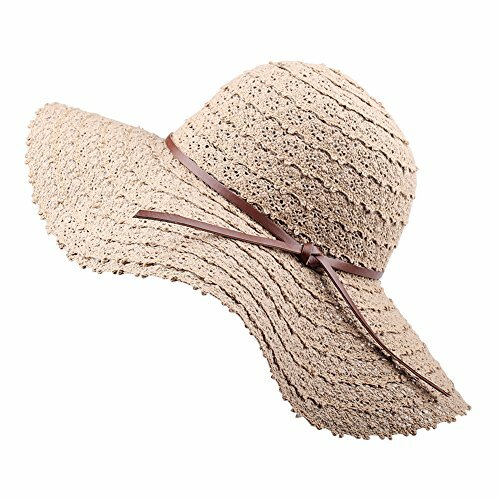 Available in beige, khaki, coffee, and violet, this stylish straw sun hat from Kekolin will be a favorite with your friends and family. It’s made of cotton and polyester to feel smooth against sensitive skin, and it’s breathable to allow adequate air flow as well. What’s more, it’s a fashion statement that looks exceptional with any outfit. 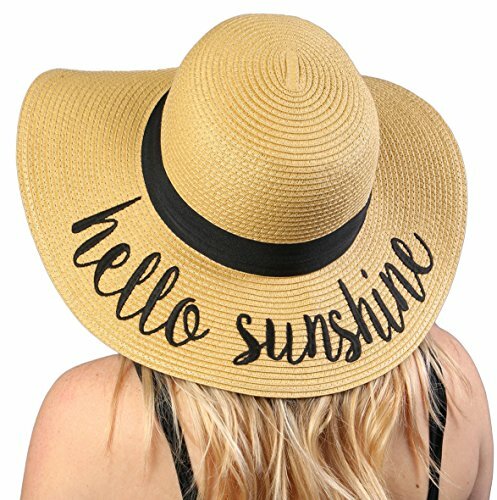 Whether you’re heading to the beach, town, or a simple walk, wearing this sun hat will put your entire outfit in a league of its own while you benefit from sun protection. 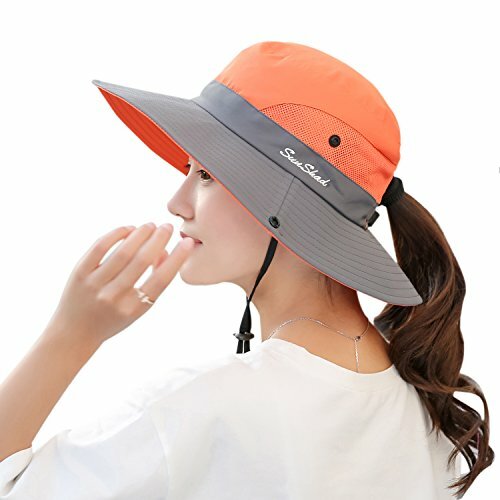 This hat, with its wide, floppy brim, will ensure your face, head, and neck is sheltered at all times while protecting it from UV rays as well. It’s suitable for use year-round, is foldable for easy storage, and will suit any outfit – be it formal or casual. Sealing the deal is the price tag. This sun hat is affordable for many people, so why not add it to your wish list today?